We have a special treat this month, our previous board (2006-2014) left us a wonderful farewell post. Thank you, Rudolf, Rudy, and Ria for all your dedication, hard work, and inspiration! 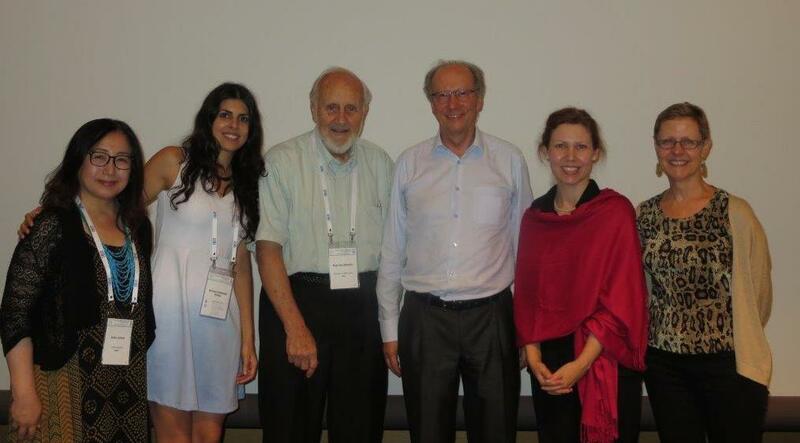 As a kind of farewell I encourage us – the Family Researchers: Be cumulative! Back from Yokohama I read a book which caught my attention at the book exhibition on the conference site. It was Robert Smith´s Cumulative Social Inquiry. He pleads for more accumulation of knowledge in sociology. In the last decades “originality” and “novelty” have dominated research endeavors. The strong tendency to be “original” and to look for “novelty” brought a mess of not related results to sociology, and I think to family sociology as well. (I found it very characteristic that in my own session in Yokohama we had a presentation on lunchboxes in England as well as multivariate secondary analysis of big data sets like the gender and generation survey, both thrilling). An innumerable amount of research questions with unrelated methods has brought chaos in results rather than a progression of knowledge. Cumulative science does not mean reproducing the very same, researching what has been researched before. Building on research results and specifying them might, according to Robert Smith, be the foundation of innovative knowledge. Thus cumulating knowledge is what brings us forward rather than a chaos of originality. I think these are more than just inspiring ideas, it could be the mission of the Committee of Family Research. An international research committee is the right place to cumulate knowledge. Not necessarily in cooperative research – though this might be the ideal – but more so in seeing what sociologists in other countries deal with, what the problems in other countries are and which questions are being raised, waiting for an answer which might be answered by raising these questions globally. I have enjoyed staying in a central position in the Committee for Family Research and would like to encourage the new board to continue promoting the integration and cumulation of global knowledge. Thank you, members, for all your help and enthusiasm in putting forward family sociology through the last eight years during which I was able to serve as president. We had several seminars world wide, sometimes two a year, a lively committee you are in. During the first meetings of the new CFR board held during the XVI World Congress in 2006, I felt fully adopted into a very special family. These meetings on the patio outside the International Convention Centre in Durban, South Africa during cool July days in 2006 contributed to an appreciation of the rich and diverse history of CFR. My long time mentor, colleague, friend and Honorary President Jan Trost expanded my research horizons in the 1970s, during my visiting fellowship at Stockholm University. Several SU colleagues stressed the need to contact the leading family scholar in Sweden. As a result I joined Jan’s family study group, which led to joining CFR. Active participation in the CFR began as part of the 2000 Uppsala seminar hosted by Jan. The seminar so rewarding and stimulating to my research that I made CFR membership and meetings my top priority. The transition of the new 2006-2010 board was greatly facilitated by previous President Bernhard Nauck and long serving Secretary/treasurer Irene Levin. Fortunately, Irene continued to serve on the new Board and her sage advice was valuable beyond measure. Our goal was to build on the success of our preceding officers and members whose efforts had created one of the largest, most active, and innovative ISA research committees. During our tenure with help from too many people to thank a variety of interim meetings were held even two during several years, full programs were developed at two World Congress with the number of joint sessions with other RCs increased, from the meeting papers many books and special editions of journals were published, a special award for early stage scholars to help pay travel expenses was established and awarded, grants obtained from the ISA help many members fund their trips to the World Congress, our constitution was rewritten and later revised to become our statues, and most importantly many collaborations and friendships were fostered. The 2006-2010 officers continued to serve on the 2010-2014 board and were joined by Members at Large Tessa LeRoux, Bárbara Barbosa Neves, and Emiko Ochiai. Like Christina Gomez and Irene Levin on the previous Board besides Board duties they each hosted one of the interim meetings. On a very personal note, I will always be grateful for the CFR Boards and members for their understanding during my bout with advance aggressive prostate cancer diagnosed in 2007. You all became an important part of my health network and team that helped successfully treat and survive with flourish still testing cancer free. I will always be most grateful. So my hope is that this is NOT a farewell note but a wish to continue the journey together as long as possible. To the 2010-2014 board I wish you all to “fair thee well” as you go forward. Proud to be one of the 3 Rs. My association with the CFR started under the African winter sun in KwaZulu-Natal, South Africa in 1996 when I attended the CFR seminar held at Itala Game Reserve. Here I met, amongst others, longtime RC06 members Chin-Chun Yi, Jan Trost, Wilfried Dumon, Ruth Katz, and Barbara Settles. I remember how I was struck by the combination of vibrant intellectual debate and warm collegiality. I immediately realized that this is a network of academics and researchers that I would like to become a part of. Since I joined RC06 I have not only met many colleagues doing interesting work, learned a lot from them, but also made good friends. Reflecting on the two terms I have served as Secretary/Treasurer of the CFR between 2006 and 2014, I can honestly say that it has been an absolute pleasure serving the Committee in general and working with Rudolf Richter and Rudy Seward in particular in their capacity as President and Vice President respectively. I am excited about the planned future activities of the Committee and the work the new board has already done. I wish them all the best. So, as I paged through many pictures taken at CFR seminars and events, I once again realized how much I appreciate being part of this ‘extended family’ of family researchers.